ChaosPro is a freeware fractal program for Windows XP, Vista and later. Created by Martin Pfingstl, it can produce fractals in real time. Those new to fractal creation will appreciate its simple interface. Advanced users can tweak thousands of parameters to produce stunning images. For a freeware program, ChaosPro has a large number of features. As expected, it can generate Mandelbrot and Julia sets. But other fractal types like Escapetime, Attractor, Quaternion and more are supported. The application is multiwindowing, multitasking and supports an unlimited number of colors. The software is compatible with UltraFractal and FractInt. 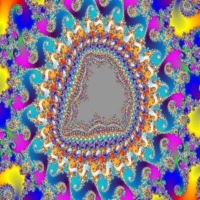 In other words, ChaosPro can produce just about any type of fractal there is. The limitation is only set by the formula you use. You can even utilize formulas made by other users to generate fractals. Among the popular ones it supports are Lyapunov Spaces, the Rossler attractor and other dynamic systems. In addition, Lindenmayer systems and IFS fractals are supported. Those new to fractal art may not be familiar with these terms, but you will get to know them better once you try the software. Even though fractals are about mathematical dimensions, you don�t need to be a mathematician to use one. You just start the program and start dragging some controls. Adjusting the settings will produce striking images. ChaosPro can make (AVI) animations. Your 2D fractal creations can be viewed in 3D. Advanced users can write their own formulas. But you don�t need to be a genius to appreciate fractals. The images are stunning and can be used for computer generated art or on the web.